Guinea pigs, just like any other small pets, need cozy and warm areas to sleep in. Ideally the bedding must keep their cages nice and dry and the right bedding will greatly reduce the occurrence of diseases associated with unclean and unsafe environments. These diseases include anything from wet tail diseases to respiratory infections. Have a look at our review as we outline all you need to know about animal bedding. We’ll also review some of the best guinea pig bedding at your disposal. How Much Does it Expand? In an attempt to replicate a guinea pig’s natural sleeping environment you may include the wrong materials as part of the bedding. It’s a common mistake and motivated by good intentions. We want to help which is why we’ve decided to outline the most popular bedding together with their unique specifications. All you need to do is pick what works for you—and your guinea pig. A casual search on the internet will show you that wood shavings are of the most preferred animal beddings on the market. 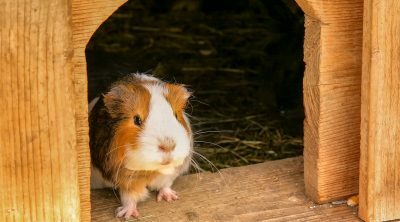 The types of wood include items such as pine and aspen as these closely resemble the guinea pig’s natural habitat. However make sure they don’t contain any aromatic oils because inhaling these oils is likely to make your pet unwell. Also note that they‘re not the most absorbent options on the market; this means they’re less likely to be as effective at controlling odors as the other types. 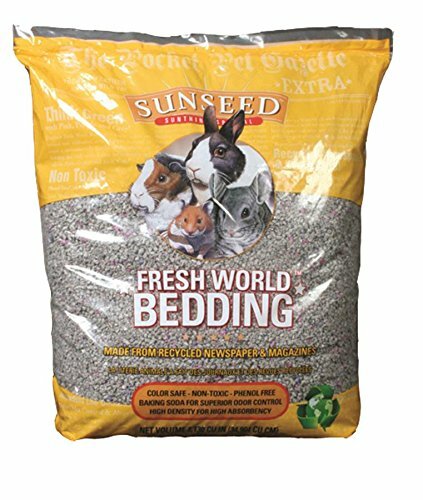 This is another popular type of small animal bedding you’ll find on the market. Though they are all paper, the quality used may differ. You’ll find some containing rougher particles when compared to the other types. On the other hand some will be more refined to give off a soft fluffy feel—reminiscent of confetti. This type is worth considering because not only is it comfortable but it encourages burrowing and nesting. Also, you’ll find some of it is available in different colors and scents. Opt for the one free from potentially harmful dyes and chemicals. Non-printed paper made with colorfast pet-safe dye is the product you want. You must be prepared to spend a little extra on paper bedding. However since it’s less messy when compared to shavings, we think the price is worth it. This is a relatively new type of bedding for guinea pigs. Since it’s made of fleece you can expect it to be ultra-soft which makes for a comfortable bed plus it’s easier for burrowing. It also has more absorption capabilities when compared to the other two materials. Note it’s the most expensive of the three—but only initially. This is because over time its effective absorption properties coupled with the right treatment will guarantee longevity. Since you won’t have to change it as frequently, it actually works out cheaper in the long run. You want to choose bedding that is effective at absorbing urine and water leaks. 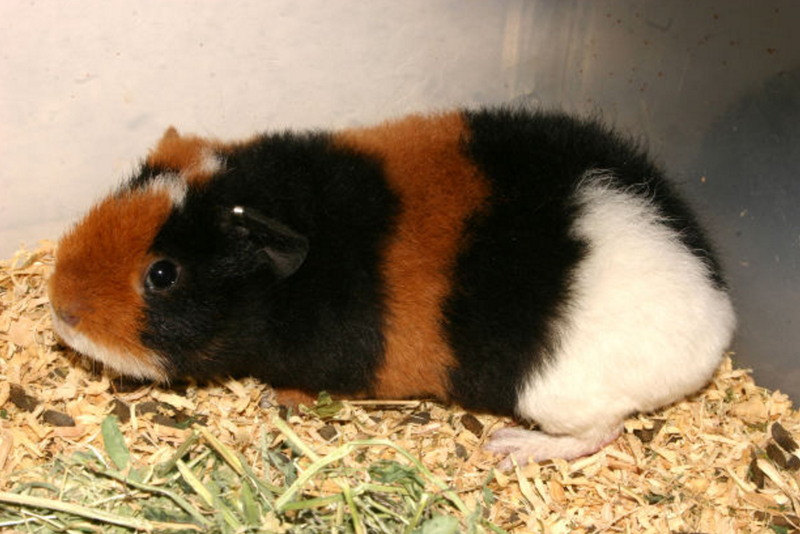 Moisture trapped in bedding will cause the accumulation of bacteria, molds and fungus; this will just result in endless health problems for your pet guinea pig. Bedding that keeps the area dry for longer is your best bet. Usually when this bedding is sold, it’s compressed in the package. The bedding which expands when out of the package is ideal. It means you’re guaranteed more layers of bedding so you get value for your money. However this will depend on how deep you want each layer to be. Whether the bedding is scented or not is worth considering. This is particularly important if you or your guinea pig have any allergies. Some scents might cause a lot of sneezing on your part as you clean and change the bedding. While some may smell subtle to you, your guinea pig may find it offensive. In dire cases scented bedding may result in breathing problems for your pet. Make sure you inspect what materials and chemicals are used in the manufacturing. Steer clear from bedding that has any artificial additives and toxins as they’ll just harm your pet. 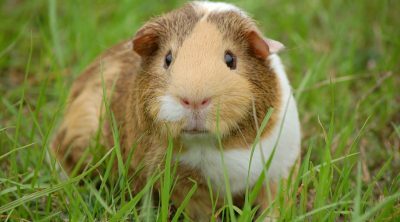 Most guinea pigs love to nibble at anything so make sure you pick bedding that’s harmless when ingested. Whichever material it’s made of will to a large extent influence the environment—especially when disposing of it. Opt for bedding made of recyclable or biodegradable material which you can discard onto a compost heap when no longer in use. You’ll probably agree that a vet’s recommendation is one worth considering right? This scented bedding comes highly recommended and is specifically formulated for effective odor control. It’s made with baking soda which is well known for neutralizing odors. This happens when it comes in contact with ammonia which is commonly found in pet urine. Your guinea pig’s bedding will be kept nice and dry thanks to its superior absorbency properties. Suffer from any allergies? Because it’s 99% dust free, it makes this product ideal for people who have respiratory conditions. Not only is it dust free but you’ll also appreciate that it’s 100% non-allergenic. Clearly this bedding is synonymous with safety—for you, your pet and the environment. If your guinea pigs are anything like mine you’ll notice they love to nibble on everything in sight. So Phresh understands this and that’s why this bedding is completely non-toxic. Disposing of it will in no way harm the environment. Simply throw it onto your compost heap since it’s bio degradable. 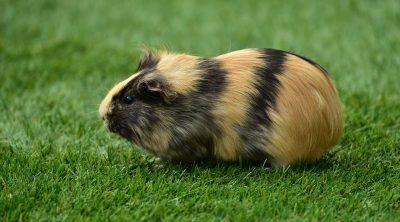 Want to create bedding for your guinea pig that strongly resembles its natural environment? Aspen shavings might just be the answer to your problem. 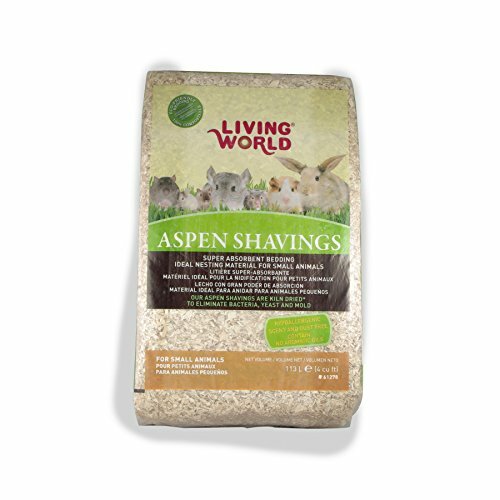 These aspen shavings from Living World Wood are made using 100% natural aspen wood. 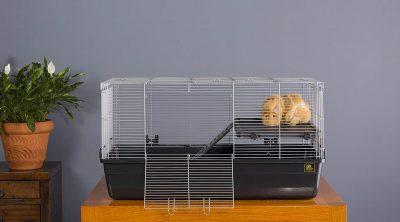 Not only are they ideal for bedding but guinea pigs can burrow and build nests with ease using this product. Your guinea pigs will be breathing clean air thanks to this bedding which is both dust- and scent-free. 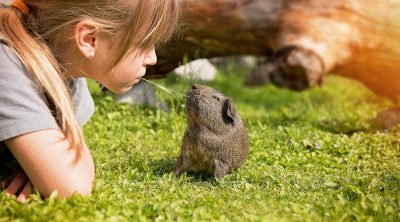 Does your guinea pig suffer from any respiratory or skin sensitivities? You can consider this bedding which won’t aggravate these conditions. This also takes care of your allergy concerns if you have a sensitive nose—particularly when you’re changing or cleaning the bedding. Not only are they hypoallergenic but they don’t contain aromatic oils that are potentially harmful. Urine or water bottle leaks are dealt with as this bedding has impressive absorption properties. 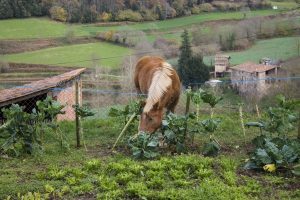 It can absorb up to four times its weight in moisture keeping the bedding area nice and dry—free from bacterial growth. Apart from keeping the bedding area dry, it also makes it pretty easy to clean. 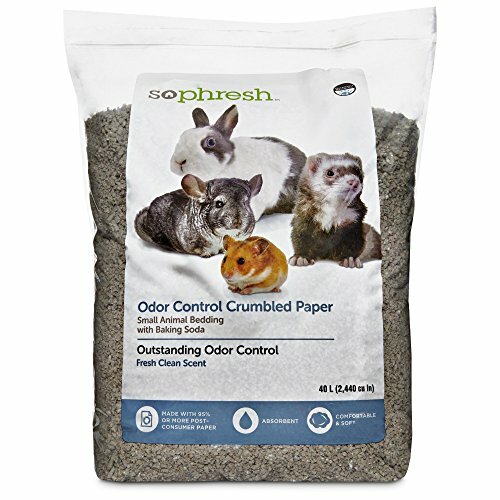 This product from Sun Seed Company is a paper based litter designed for animal bedding. Like the aspen shavings reviewed above it’s also made with baking soda. It’s well known for its superior odor control so if you want bedding that keeps those nasty smells at bay, this is for you. Environmentally conscious? Then you can consider picking this bedding which is made from phenol-free recycled newspapers and magazines. Its absorbent abilities are quite impressive as it also effectively keeps the area dry. It comes in a gray color to closely replicate the guinea pig’s natural environment. You’ll also appreciate that it’s weighty. Litter won’t be flying all over the place as the guinea pig plays. It can last up to two weeks with minimal odor and moisture. You can also opt to scrape off any poop. If you remove the moist areas and replace with fresh litter you can go for another week. Generally there are four good layers in one bag. However this will depend on how deep you want your litter. Overall it’s a good buy. Its only other downside apart from the price is the pieces are quite small. As a result they might end up sticking to your pet’s hairs. Carefresh is also among the most popular brands when it comes to animal bedding options. Each product is made from scratch using pillow soft fluff. This basically takes care of your guinea pig’s comfort concerns. This same fluff is kept ultra-dry, for the most part because of its ultra-absorbent abilities. When compared to shavings, this confetti has two times more absorption properties. The bedding area is kept smelling fresh for up to 10 days, which is quite impressive. You’ll also find that it has low dust particles which make cleaning or changing a breeze. Persons with allergies will definitely appreciate this attribute. Who said guinea pigs’ bedding has to be dull and boring? 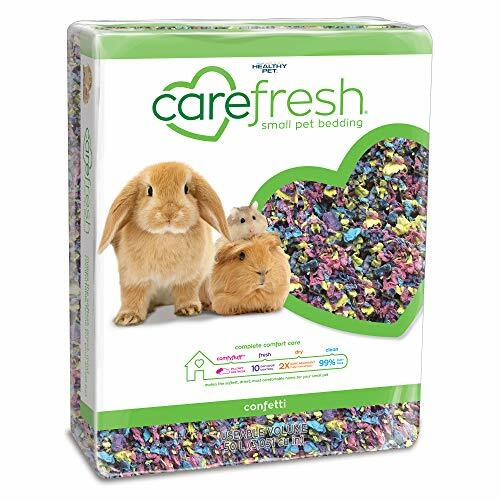 You have the option of brightening up your pet’s habitat with this multi colored confetti. In case you’re worried it has harmful colorings, it’s made with pet-safe dyes. This brand knows what works. For it to last long we’d highly recommend you remove any damp or soiled spots as you change and replace with fresh bedding. Our only major concern with this product is the advertising. Marketing often states twice the weight of the actual product which is misleading. Want to spice up your guinea pig’s bedding area? 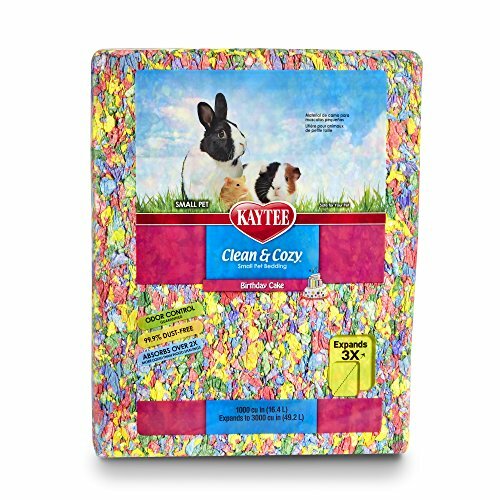 This colored animal bedding from Kaytee Clean might just be what you’re looking for. It’s available in different colors and scents to choose from so you can add variety to your pet’s bedding space. Though colorful, it won’t cause any stains because it’s made of colorfast properties. However note that not all people will like the smell of the confetti. Some might find it slightly overpowering. Your guinea pig will appreciate this pet paper bedding which allows for burrowing and nesting. This super soft bedding is not only comfortable but it keeps the area dry. It absorbs twice as much liquid when compared to the wood shavings, so it’s an impressive product providing great convenience for pet owners. When opened the bag expands up to three times its original package size. This means you can expect a lot of layers making it a very cost effective option. You can also expect a cleaner cage because it’s 99% dust free. This means no more sneezing every time you have to change the bedding. The litter is made using remnants & trimmings from different hygienic products. As a result this is an environmentally friendly option as disposing it won’t mean it ends up in landfills. We’ve rounded up only the best bedding options we think your guinea pig will love. But if we were to pick only one then we’d go for the aspen shavings from Living World, the main reason being I’m not particularly big on scents. 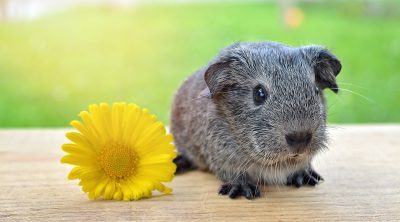 Scented products might smell good to you but your guinea pig may not feel the same as pets tend to find them over powering. Also, because the wood shavings represent what is closer to a guinea pig’s natural habitat, it makes this a winner. Not that we have anything against the brightly colored confetti. At the end of the day it’s ultimately a matter of preference.